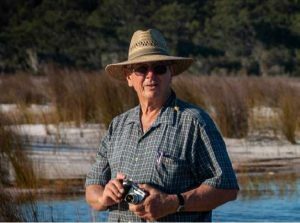 Maryborough-born John Sinclair worked tirelessly for 48 years advocating for conservation of the natural environment. His greatest battle was protecting the pristine lakes and forests of K’gari (Fraser Island) from the threats of sandmining and logging. John’s legacy is that K’gari is now a World Heritage site, a National Park, a major tourism destination and a centre for scientific research. In 1971 he founded the Fraser Island Defenders Organization, FIDO. In 1976 he was named as The Australian newspaper’s Australian of the Year. In 1990 he was selected by the United Nations Environment Program in the Global 500. In 1993 he was presented with the Goldman Environmental Prize. In 2014 he was appointed in the Order of Australia. He was awarded an Honorary Doctorate from the University of the Sunshine Coast in 2017. John Sinclair passed away in Brisbane on February 3, 2019, aged 79. Did you see under Tin Can Bay Inlet?